Sometimes geopolitical changes make headlines, but other times they slip quietly under the radar. In particular, small modifications to national flags often fail to make the news. To make sure you don't miss anything, here's a report on one such flag change that even we discovered only recently. 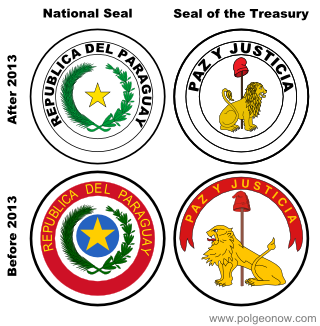 On July 15, 2013, Federico Franco, at that time the President of Paraguay, announced that the official seals on both sides of the Paraguayan flag would undergo changes in order to better represent the symbols first chosen for it in 1842. These two seals together make up the national coat of arms of Paraguay. Franco said the modifications were the result of a long debate and “a consensus that is not often achieved among historians”. There had already been several changes to the seals in the past, especially after the Paraguayan War of 1864-1870, which pitted the country against Brazil, Argentina, and Uruguay. One of the biggest of the 2013 changes was to the ring around the star, where it says “República del Paraguay”. This ring has been red since about 1988, when it was changed under the rule dictator Alfredo Stroessner, whose political party was represented by that color. It is now white. 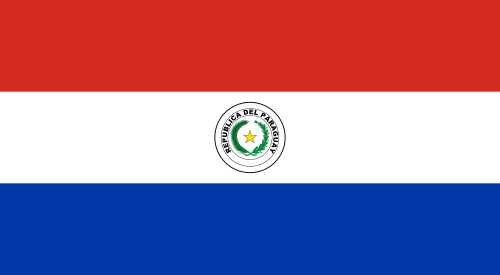 The blue background behind the yellow star has also disappeared, and the text of the phrase “República del Paraguay” has changed from yellow to black. On the reverse side of the flag, the roaring lion is now a light ochre (golden) color instead of yellow, the spear behind the lion is brown, while the cap on top of the spear, which according to tradition symbolizes liberty, continues to be red. The inscription “Paz y Justicia” (Peace and Justice) is now black instead of yellow, and the banner behind the inscription has gone from red to white. According to Paraguayan Minister of Linguistic Policy Carlos Villagra Marsal, there were also unfruitful efforts to replace the palm frond on the National Seal with a pindo palm, and the olive branch with yerba mate, which would in his opinion have been better national symbols. However, he said the historians preferred to return to the original designs, rather than add entirely new elements to the flag. Since its independence in 1811, Paraguay has had four different major flag designs. The first flag of Paraguay, called “The Blue Flag,” was a royal blue color, with a six-pointed white star in the upper left corner representing the Virgin Mary of Asunción, who is the patron saint and namesake of the country’s capital city. The Blue Flag was in action from May 15th (the day Paraguay became independent from Spain) until June 16th of 1811. In 1826, it was reinstated by President Gaspar Rodríguez de Francia, and used in alternation with the red, white, and blue tricolor until the early 1840's, when Francia died. Paraguay’s second major flag design, used from June 17th until August 15th of 1811, was made up of three horizontal stripes of red, yellow, and blue. The red and yellow stripes on the top were taken from the flag of Spain, while the blue stripe on the bottom represented the Virgin Mary of Asunción. The third flag had the same color scheme as the present-day Paraguayan flag: red, white, and blue horizontal stripes. Red represented justice, white peace, and blue liberty. However, in the initial design the middle white stripe was wider than the other two, while the present-day flag sports three equal-width stripes. The early version of the flag was used until September 30th, 1812, when it was modified so that the three stripes were of equal width. The new tricolor was called the “first flag of the Republic”, since 1812 was the year Paraguay declared itself a republic, formally shedding its past as a province of Spain. The seals of the Paraguayan coat of arms were added to the flag in November of 1842. On the front, the seal of Paraguay: a palm frond and olive branch intertwined at the bottom and open at the top, with a star in the middle, and the inscription “República del Paraguay” (Republic of Paraguay) above. 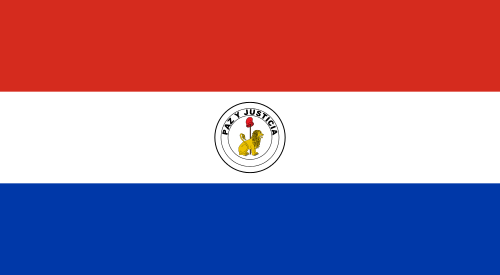 On the reverse side of the flag, the seal of the Department of the Treasury was added: a lion within a circle, with the words “Paz y Justicia” (Peace and Justice) above. 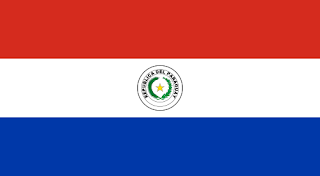 Graphics of the Paraguayan flag, other than the red, gold, and blue tricolor, are in the public domain (source).